In this post, we will learn the Leave encashment process using Saral Paypack. Leave Encashment is a process were the unused leaves of an employee can be exchanged for money. In Saral PayPack, Leave encashment can be defined as per the employer requirement. 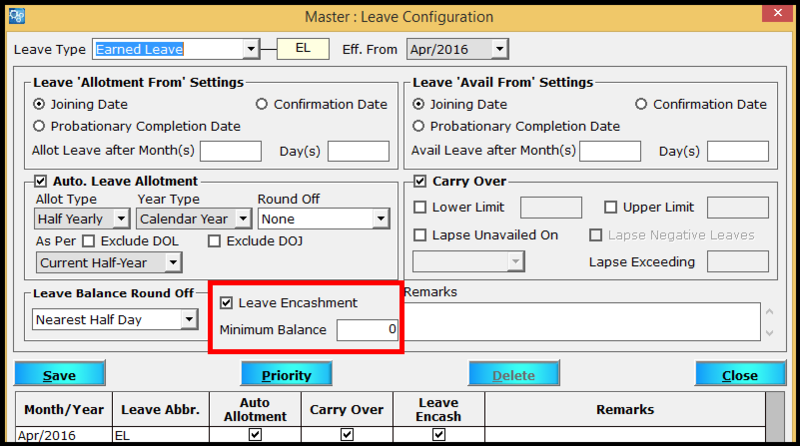 To enable the option of Encashment, go to Leave Allotment under the Attendance menu and select Leave Definition. Here, we will define the leave which can be encashed. Enter the leave details and Save. 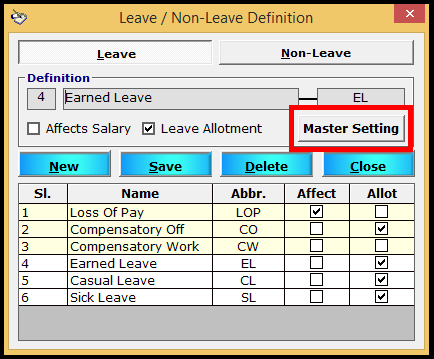 For e.g., enter the leave name as Earned Leave and save. Now, click on the Master Setting button to do the required settings. 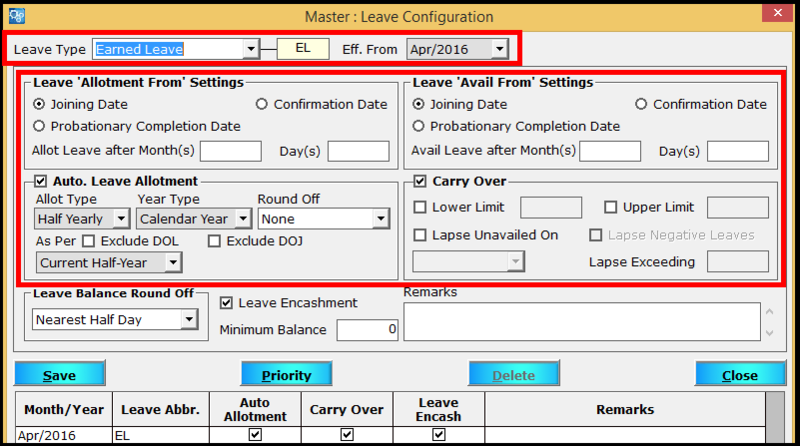 In this screen, select the leave type as Earned Leave and the required month as an effective month of the settings. Next, do the other required settings like Leave Allotment, Leave Avail, Auto Leave Allotment, Carry Forward etc. After these settings are done, enable the option Leave Encashment. Here, the minimum balance that an employee should have to claim Leave encashment can also be defined. i.e. 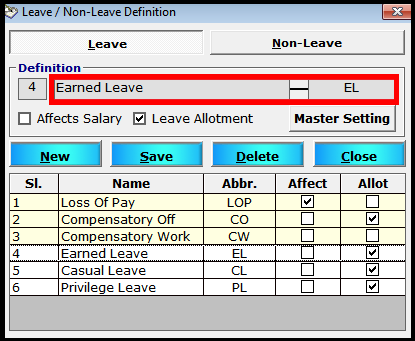 If the minimum balance is defined as 5 and the employee has a leave balance of 20, then the leave encashment can be taken only for 15 leaves (20-5). After the setting is done, click on Save to save the details. 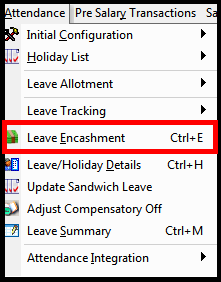 Next, to encash the leave, go to Leave Encashment under the Attendance menu. In the window displayed, select the month of Leave encashment and the employee for whom the encashment is given. Now, select the leave type on which encashment is given. The leave balance available for encashment will be auto taken. You can encash all the leaves or required leave as per requirement. 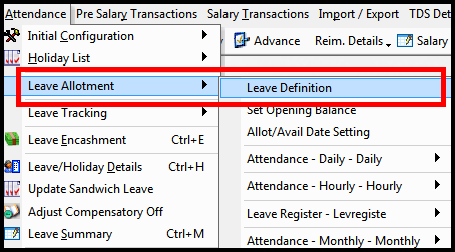 After selecting the leaves, enter the per leave value. You can enter the value manually or click on the “F” button to create a formula and derive the value. You can also select on the “R” button if the unit value has to be one-day pay for a certain salary component. 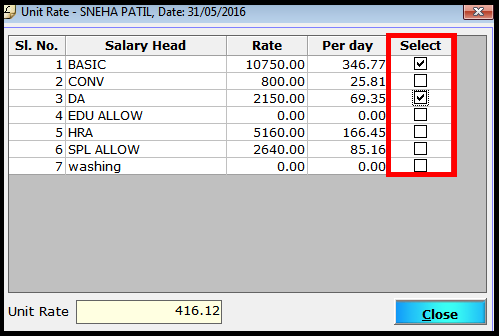 Like if one leave value is equal to one day pay of BASIC and DA, select the same. 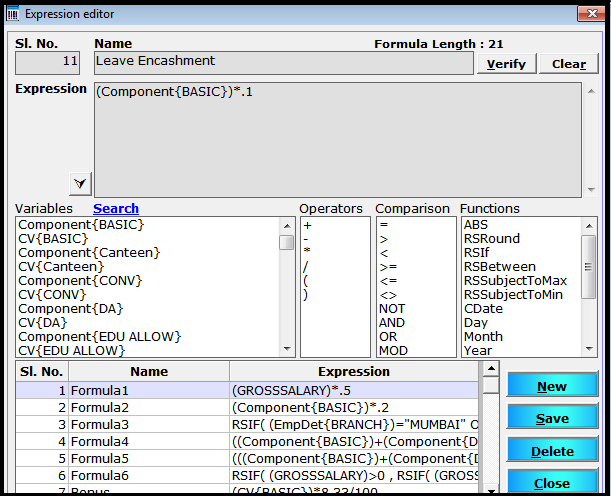 Based on the unit value derived, the encashment value will be calculated. Now, select the mode of payment to the employee i.e. In Salary or in Full and Final Settlement or on Retirement. Depending on the selection, the amount will be paid to the employee in a particular mode. Save the calculation by clicking on Save. The same can be seen in the relevant report. i.e., if paid in salary then Payslip of the month, if FFS then in FFS report and if on retirement then in retirement FFS report. 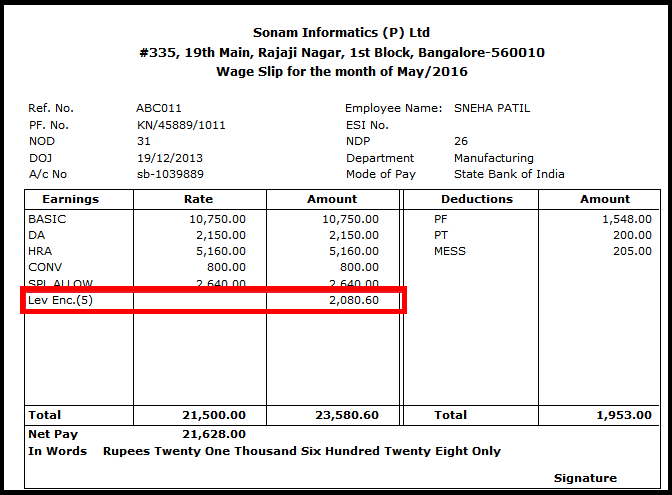 And that is how you provide leave encashment for your employee using Saral PayPack. If you have any questions, let us know by commenting below. Such type of tutorials are good for the understanding of users. Please keep posting such kind of tutorials regularly. Thanks to the team. These type of Tutorial are very helpful. This was clear understandable with scrolling screen shots,this save our time and your support team. Appreciate the leave encashment processes info…please do enlighten with such subjects in coming days.. This comment is from relativity where we need some extra features and clarity. The calculation of Leave Encashment in Saral Pay pack is based on the number of days in a month but practically we are dealing with clients where present days will be the paydays. So it is difficult for us to process when the calculation constantly remains on the number of days in a month. Secondly, the formulas that are derived in the software we need a clear derivation so that we can understand it manually and process. And also provide the steps to be done in multi encashment.